Since 2001, the US Dollar has lost half of its value every 4 years. Of course, its actual value dithers about, sometimes more than this theoretical value and sometimes less, but as you can see from the chart below, it tracks very close to this decay line. 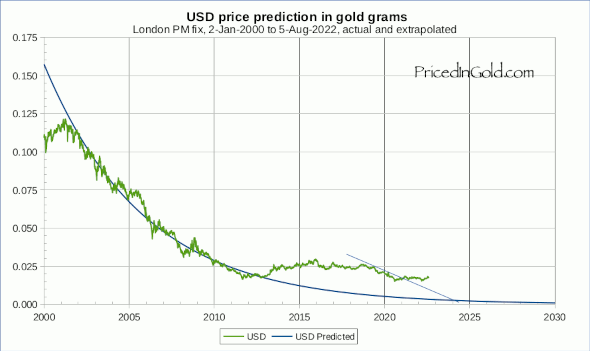 The chart below also projects this line into the future, giving a reasonable guess at what the continuation of the last decade's policies will do to the USD's value in gold terms. Let me be clear: there is nothing "natural" about this decay curve. It is the result of carefully crafted monetary policy. Central banks wield huge power over the value of their currencies. This is particularly true of the Fed and the USD. Will these policies continue? There is no way to be certain; if debasement is pushed too hard, people may lose confidence, leading to a dollar collapse. But to reverse the trend would push interest rates sky high, and result in budgetary and monetary chaos as well. Thus a continued steady devaluation of the dollar is likely the "best case" central bankers can achieve. When the USD moves much above or below the forecast value, there is a tendency to revert to the predicted value. As the chart below shows, deviations more than 10% seldom last very long. These extremes may be tradable if you are willing to wait a year or two before taking profits. So if this is a managed devaluation, what do you think the Fed's end game is? Thanks for the quick reply. Agreed. I think either the "slow grind" route of debasement or the "sudden death" route of collapse is going to be bad for holders of dollars. It's not going to be pretty either way, but I'd take high inflation, capital controls, and police state antics over all-out world war any day. However it plays out though, the end result for holders of dollars (and other debased currencies) is that they will be poorer over time assuming wages do not keep up with the expansion of the fiat supply – which they won't. I think the Fed and all the other central planners are going to try to keep the fiat game alive as long as possible though, because the power to manipulate the money supply is possibly the greatest power available to man. I think competition from gold-backed trade mechanisms might force their hand at some point in the future, but for now the printfest continues! In the mean time, I'll keep trading my dollars for gold. Cheers! yeah paper currencies are crap and are constantly on downward spiral.Still not convinced with gold being ultimate holder of value.If Im not mistaken they dig up huge amounts of stuff every year close to tens of thousands of tons.Since a human only lives for 90 years tops I guess the wisest way would be to take into account irreversible loss of value of any "valuables" and adjust accordingly. Don't worry about the pitiful amounts of gold they dig up each year diluting the value of your gold hoard. It pales in comparison to the market manipulations the bullion banks are capable of. But the BB can only manipulate gold so much before they have to give in to market pressure and let the market find it's true price once again. Otherwise they lose their shirt. If you're so worried about dilution that you think mining companies are a threat, then your only recourse is to the art of dead artists and to real estate, neither of which are fungible assets. Dear Sir Charles, thank you for an exciting and informative site it is much appreciated. When was the last time the USD moved +60% above the trend line (are there similarities to the big jump just before dot.com crash in 2000? ), and should we expect a corresponding deviation to -60% as a correlation to the upward move? Would this mean we could expect a gold price of around $2,800-3,000 when the USD reverses to -60% below the expected trend line? I think you your idea and concept of the “Half-Life of the US Dollar” is a very smart and a useful indicator for the predicted trend of the USD. 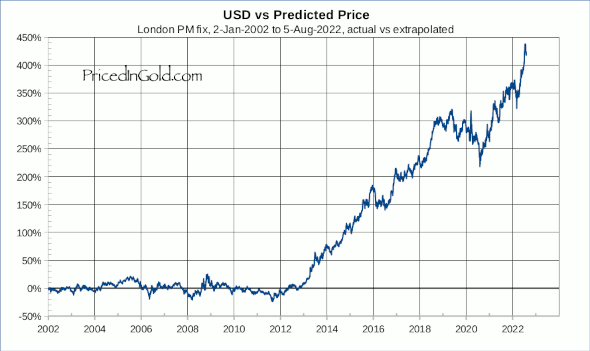 It would be interesting to see the graph in more detail for example where it follows your “The US Dollar since 2006” graph? Any thoughts on how I can make my own “Half-Life of the US Dollar” graph? The financial establishment along with the politicians they have in their back pocket consider gold to be a "barbarous relic" even Warren Buffett has painted it as a relatively "useless" mineral. We dig it up at great cost, then bury it in secure vaults where it earns nothing and costs money to protect. HINT, could that be because it HAS real value? Sounds logical on the surface that it is not a good investment, but as the late Paul Harvey used to say, now hear the rest of the story. Gold and silver have been utilized as money for thousands of years until the Babylonian temple priests acting as the original "bankers" (what safer place to keep your money?) realized that hardly anybody ever came for their gold because the paper receipts they issued were readily accepted by merchants for trading purposes. held by the issuer, and this FRAUD devolved into a gigantic Ponzi scheme that European Bankers foisted off on Congress to legalize their fraudulent practices that in 1913 became the Federal Reserve Act. These "paper receipts" eventually became to be viewed as money itself rather than just currency proving ownership of REAL MONEY and once the connection to gold was terminated in 1971 by President Nixon, it was all downhill from there. Irresponsible bankers and our elected politicians soon learned how to "game the system" by unrestrained spending and unrestricted currency printing to benefit their "inner circle" of crony capitalists while saddling the middle class with un-payable debts! Seems to me the logical question to ask is, by what reasoning or logic should our supply of currency come into existence as DEBT on which a privileged ELITE are allowed to collect interest, (which is mathematically impossible long term) hence my labelling it a PONZI scheme, or if you prefer, a "legalized counterfeiting scheme" from which all but a few are excluded. The mantra of the banking establishment is "the magic of compounding" to get the masses borrowing and investing in debt instruments without disclosing that this is itself a FRAUD, because mathematically not everyone can be a net recipient of interest, otherwise there would be no-one left to pay it. Why is interest long term impossible you ask? Mathematically the answer is very simple and it amazes me that all the "high muckety mucks" with their college degree's from Harvard and London School of Economics either can't figure it out even though it is staring them in the face, OR, they are in on the deal and are afraid to speak out because it might threaten their ability to hold a high paying and prestiges job? It was no less than a Central Banker who "spilled the beans" in sworn testimony before Canada's Parliament in 1939 who testified truthfully that "every bank loan is a new creation of money, and when it is paid back it ceases to exist' which explains the financial dilemma the whole world seems to be in to-day. Even our grandchildren can not ever pay back in real money the "Pyramid of DEBT" that has been created since the establishment of the Federal Reserve Act. Since ONLY the principal of a loan is ever created, it necessarily follows that the only way that interest can be paid, is with exponentially rising levels of DEBT that replaces old loans paid back, PLUS the growing debt pyramid of interest that is not created and therefore not payable except through inflation. Inflation figures are then manipulated by government bureaurats to hide the simple truth that fiat currencies eventually return to their intrinsic worth of ZERO! Central Banks inflation target of 2% is designed not to alarm the masses but in reality is much higher than officially promoted figures. I would like somebody in government to explain to me why we as natural born citizens who elect them to represent OUR interests, are instead "on the take" from the bankers who are ripping us off? There is no logical reason I can see why our currency should not come into existence as a CREDIT based on the natural resources of the country, that are given added value by human LABOUR! How about a "for-instance" to make my case? Anything physically possible and desirable, (good for the citizenry) CAN and should be made financially possible. Since all we do any-way is print paper currency, is it not time the government supposedly representing US, the taxpayers, took the printing plates (which they have the power to do) back from the elite bankers, destroying their ill gotten MONOPOLY? The government on our behalf could print the money needed for all infrastructure, roads, airports, electric grid, sewers and waste treatment plants, schools, hospitals ad infinitum as a CREDIT against the natural resources we possess and the wages needed for the private sector to build whatever is needed for the benefit of society. In other words "currency" would be backed not only by gold BUT all the infrastructure society needs at ever more prosperous levels, but without "PAYING TWICE" by being beholden to the banking cartel. What would this accomplish? Well it would simply cut out the middle men (bankers) who contributed neither the raw materials needed, or any labour, and using an average 25 year payback, (useful life) the government would only need to tax back the original principal created, saving on average about 50% of the cost of the things society needs. Instead of the wage earners DEBTS increasing out of all proportion to wage increases, imagine your taxes being REDUCED by 50% or more, your house costing 50% of what it does now, would things not be much better for a shrinking middle class compared to the "paycheck to paycheck" perpetual debt existence the masses are experiencing to-day? Our financial problems are solvable except for the fact that nobody in authority has the guts to stand up and say, "the emperor has no clothes" where are our supposed leaders? @Myron Martin: Thanks for your explaniation of the FRAUD we live under "oppresssion"
Curious if you’re planning to update the “Half-Life of the dollar” charts soon? I’m eager to see that changes over the last week. i found your site, on a google-whim, wondering what the price of dollars has done across time against the weight of Au. locating your site, is like diving for a few pieces of eight, and finding a treasure trove — thank you for all of your efforts and interest in this area. would you please update your graph the half-life of the USD, when your travels wind down? Can we get the first chart with logarithmic y-axis as well? Are we seeing an [epic] head-and-shoulders pattern setting up? Hi Seth, That's exactly the way it looks to me! The annual production of gold is likely less than 4000 tons a year, including nontraditional sources. This amounts to roughly 2% of above ground gold reserves. Two percent!! Compare that to the money expansion seen since 1913, or the growth in population. If anything, gold gets rarer for every year, measured in gold per person! Yet the current deviation, sitting at 220%, is now in its 5th year. "Very long" is relative, what is 5 years on a chart that tracks only 15? @Brad Soho: LOL! You make a great point, Brad! This run-up certainly surprised me, and continues to amaze me. This period of exponential decline had a well defined starting point in 2001, and may have ended in 2013… or it may simply have gone on an extended hiatus, only to resume (possibly with a vengeance) in the next few years. I'll keep updating this chart, and we can see what happens! Thanks for your comment!